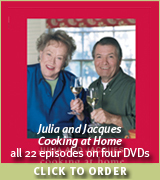 Celebrate the 10th Anniversary of Julia & Jacques Cooking at Home – airing on public television stations nationwide. Two of the world's best known and most loved culinary stars, Julia Child and Jacques Pépin, join each other in Julia's home kitchen for this popular Emmy Award-winning public television series. America's favorite cooking duo takes you to the heart of good home cooking and shows you that while there are traditional ways of preparing a dish, nothing is written in stone. These two legendary cooks play off one another like The Odd Couple, joking, even bickering good-naturedly, over kitchen technique, demonstrating that cooking is deeply personal and that there's often more than one way to get great results. Their deep friendship and the high professional regard in which Julia and Jacques hold each other make the show a pleasure to watch. For video clips of select cooking segments, visit Julia.Cookstr.com.